This was a another powerful episode. Framed by interwoven sequence of the unprovoked abysmal misery of our its first shots, Anna again not receiving any letters from her husband in prison (“it’s been weeks”) and (the 2nd sequence) Bates in line made to understand there is nothing for him, and its last shots, first Bates, then Anna, and then both superimposed as they read their letters and feel the presence of the other through the power of letters, it presents four direct attacks on vulnerable in effect powerless people, the attack orchestrated as much by the person the attacked person finds him or herself turning to as the people who mounted it — because they could. While (as with many novels seeking a wide readership), enough is given the viewer to take the establishment point of view in each of the crisis confrontations and side with the person disdaining, scorning, excoriating, depriving the vulnerable down-and-out person, the way each is presented and the ceaseless reinforcement (one of Downton Abbey‘s strength is its lack of subtlety) of the super-comfortable (supposed at least identifying with) privileged rich type, the whole emotional trajectory of the circumstances we are given (Ethel gives up her beloved child, Tom sick with worry yet frantic to avoid the prison the episode makes clear will be a horror, even if it doesn’t end in torture or execution) makes us side with the wounded, those the very structure of the society as such, its norms turns into a victim. “There’s no turning back now for Ethel” says Mrs Hughes. And she’s partly right. It’s not that Ethel has no life, but that she has a lousy one. Because there was no decent job for her outside service. In the same phase 4, we finally learn that the reason Anna and Bates are suffering is simply that the warden had taken a dislike to Bates. 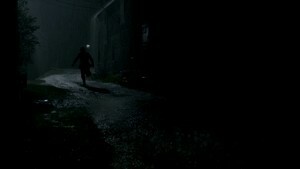 Perhaps he seemed too unhurt, too steely, well, as a mate tells him, the warden now dislikes Bates’s mate, and so means to plant evidence in a cell against Anson. 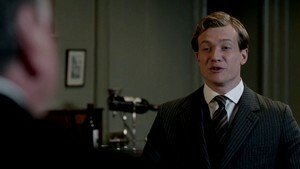 Bates asks the man why he is helping Bates; the man says he detests Anson too. Certainly breaks any providential patterning, no? There perhaps needed half an episode or at least a montage of the hovels the Catholics live in, some sense of the lack of any right or power for Catholics to change the law and situation. Probably Fellowes despite demurs and self-defenses (in the second book produced by his daughter, The Chronicles of Downton Abbey, he responds to critics trying to show he is not the reactionary neanderthal they have been describing) cannot accept that if not direct violence the threat of it, felt, is what makes entrenched orders compromise, give up some of their luxuries and in Lord Grantham’s shocked tones about “private property” attacked (!) 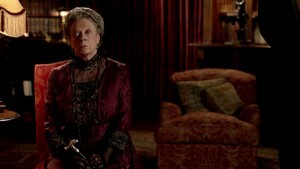 there is an incisiveness even the Dowager fails to inflict. Fellowes nonetheless shows us how Grantham not shows a complete lack of imagination except when it comes to the wealthy’s suffering (as does his daughter, Mary). It’s very irritating the way Grantham lights into Tom — no understanding of what the Anglo-Irish did at all, no memory it seems and excoriates him as a coward for his leaving Sybil behind but then we discover Grantham is seriously undermining the family by not facing up to his real income. During the course of the episode Matthew discovers the huge sums he has given into Downton will be lost because of Grantham’s mismanagement (too big a staff is part of it). We have seen seen how unscrupulous both Mary and the Dowager were to get their hands on yet more of Mrs Leveson’s “late husband’s money” as she puts it. If Grantham does not know he is “in a harsh world,” it’s because he’s laid his hands on money he never earned. 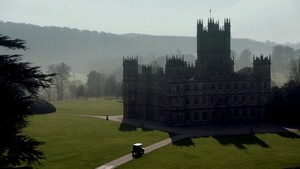 Matthew does not dare it seems bother him and uselessly goes to the Dowager; Julian Fellowes says in The Chronicles he has made Lord Grantham a dullard. wishing her dead that she tends her tirelessly night and day (at least that is how I remember it). This servant really is the prostitute with the heart of gold. She really does buy into a social order, in her heart of hearts, in which the the lord and lady mimic the role of kind and queen–mystical creatures that is sinful to wish dead. 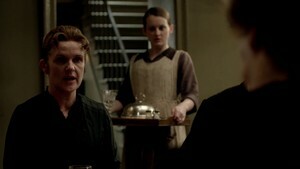 On first viewing I thought the low point came in the fourth thread: Edith goes to her grandmother (will she never learn?) for empathy, to be told “quit whining” (a favorite word for Charles Krautheimer, among the most odious of the “intellectual” republicans); this from the woman whose mockery made Strallan crumble and reinforced that humiliation scene. 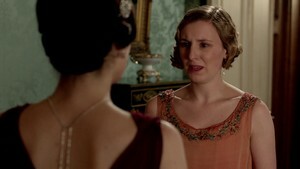 In the book Fellowes makes his parallel of Anna with Edith explicit. 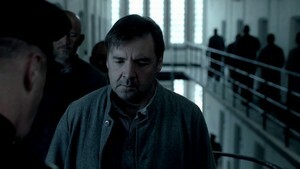 He begins with how Mr Bates is a much older man, also lame. Fellowes does not go on to say that Anna is not driven away because she is not regarded as equally valuable, equally able to “get something better” in the marketplace, but that’s a central difference between them. Fellowes understands that we are not intended to take the Duchess like a character in a novel; Downton Abbey is closer to a filmed play. In the scene where Tom is called upon to explain how he could have sided against the people in the great house (Mary says she came out with the daughter! ), the Countess persists in her witty idea that the Irish were quite right to burn such a hideous house down. Edith does come up trumps by writing to a newspaper against the disapproval of everyone around her (like Tom and Ethel). “Thank you for the vote of confidence” says Lady Edith to her father who settles the question of her attempt to be a writer to newspapers with “she’ll never be published.” Unexpectedly her article is published,even with a comment. Chance? it hit the right spot that moment. Matthew congratulates Edith, but like his mother his willingness to buck the powerful and stand up for what he perceives is good is limited. In the scene with Mary in the nursery she wants to turn into their sitting room, his gestures, intonation, facial blenching reminded me of Robert Bathurst playing Strallan. So what does it all add up to? 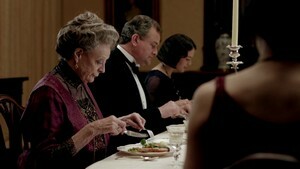 Am I arguing that after all Downton Abbey is subsersive art. No. I am showing how it works and why it grips those of us who watch on. The way to understand a film is to capture the shots one by one. The shot is the word of the film, and the sequence of stills the sentence. Meaning arises from a Barthes-like response to mise-en-scene, which is worked on arduously from teams of people in production and costume design, the director, the actors, each nuance studied. Fellowes has no text he is adapting, and reminding me very much of another politically conservative adapter who did books apparently close to Fellowes’s heart, Trollope’s Pallisers, Fellowes has little filmic intertextuality. We can’t find out what is the ethical perspective as we can from some films by looking t other films comparatively and it is not sophisticated filmically. Few flashbacks, hardly any voice-over. The montage which ends Part 4 is unusual. Historical accuracy in it is used to provide enough verisimilitude but the way we are brought into the world of films is through readily available archetypes which cut through its veneer of a past into the present of the viewer. Here and there in The Chronicles (as Fellowes did in the first book, The world of Downton Abbey) Fellowes does cite a book or an actual case or story in a newspaper at the time. Bates and Anna’s story is partly founded on a real life trial of a man named Harold Greenwood accused of poisoning his wife to death with arsenic who as gotten off by a brilliant lawyer — and Agatha Christie’s The Mysterious Affair at Styles (pp. 237-38). But these only give local direction. What it does not do is deliver simplistic cant on how to live or how to take our lives. And much that is there can be extrapolated this way and that. “If only that were true.” Amen.